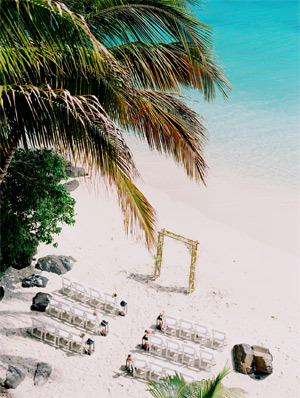 - Getting married in St. Thomas at our incomparable property could not be easier! 1) How do I start planning my wedding at Sand Dollar? You should know the estimated number of guests and dates for your events. If possible, choose a few alternate dates in case your first choice is not available. Once you have this information, contact us to make sure the date is available. We will help you find wedding planners and caterers who will assist you in planning your dream wedding. 2) What is required by the U.S. Virgin Islands for a legal wedding ceremony? There are no residency or citizenship requirements. There are two forms that must be completed and returned to the territorial court and approved at least 8 days prior to the wedding date. You can download the license application form from their website www.visuperiorcourt.org. The couple must personally appear at the courthouse to pick up their license. As a U.S. territory, weddings are legal and binding, the same as if married in the continental United States. 3) What is the process for obtaining a marriage license in the U.S. Virgin Islands? Certified check or money order for $200 made out to the "Clerk of the Superior Court"
Letter to the court outlining the dates that you plan to stay in the Virgin Islands, your wedding date, and your contact information. These documents must arrive at the court NO FEWER THAN 8 DAYS PRIOR TO YOUR WEDDING DATE. When you arrive on island, both of you must present yourself at the court house between 8:30 am to 4:30 pm on a business day or between 9:30am and 10:30am on a Saturday morning. Note: the courthouse is NO LONGER open on Saturdays unless you make prior arrangement AND pay a $150 fee. The court house is closed on holidays. Please check to make sure that they are open before your wedding date. You must have two witnesses of legal age to sign your marriage license. 4) Do you offer assistance with the license paperwork? Most wedding planners we recommended will be happy to assist you. Additional fees may apply. 5) How many days in advance of the wedding ceremony should I arrive? We recommend that you arrive at least 2-3 days prior to your wedding day. This ensures that you have plenty of time to pick up the license and touch base with your wedding caterer. 6) Do we need passports to come to St. Thomas from the United States? While passports are not currently required, they certainly make everything easier; especially if you decide to visit the British Virgin Islands. At the very least, you should travel with an original copy of your birth certificate and a valid driver's license. 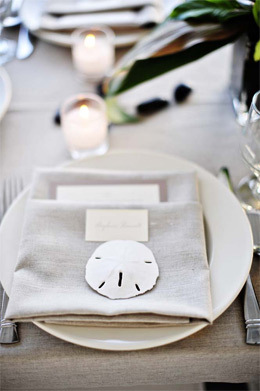 7) Is there wedding venue fee to marry at Sand Dollar? There is no additional fee to marry at Sand Dollar. 8) What is the average cost per person for food and beverage for wedding at Sand Dollar? Depending on the total number of guests and your preferences, the price will vary. Please discuss directly with the wedding caterers, they will design the best option to suit your needs. 9) What weather should I expect in St. Thomas? Year round the island of St. Thomas offers temperatures not greater than 90 degrees and not less than 70 degrees with pleasant trade winds. 10) Can I save money by marrying during the off-season? Certainly! May, late October and early November are the most popular times for weddings at Sand Dollar. The temperature is around 80 degrees, and both you and your guests can enjoy a lower off-season rate for accommodations throughout the islands. 11) What does the wedding planner/caterer provide for weddings and receptions at Sand Dollar? From flowers to photography, videography, music, and catering for the event; the wedding planners/caterers handle all aspects of your event from the first day you contact them through the day of the event. They ensure that you have everything you need and all services you have requested are fulfilled. On the day of ceremony, they provide food, beverages, tables, chairs, linens, silverware, glasses, and all decoration if necessary. They can also provide a wide range of specialties and personalize your event. 12) How can I arrange for flowers, photography, videography and music? Your wedding planners/caterers will help you to arrange for flowers, photography and music. Please discuss with them directly for cost and preference. 13) How do I choose the food for my wedding reception? Your wedding caterer will assist you to choose from their extensive menus, from intimate dinner to lavish gatherings. 14) My guests have special dietary needs; what are the options? Your caterer will be delighted to offer a selection of vegetarian and vegan cuisines for any dietary need. Please consult with them for more details. 15) Can the caterer provide wedding cake? Yes. They offer have a wide selection of fillings such as chocolate, vanilla, lemon or any special flavors. Most of the wedding cakes are two-tier white cake with your choice of filling and white frosting. We suggest you avoid elaborate sugar work or fondant, due to heat and humidity in the islands. 16) What kinds of flowers are available in St. Thomas? The local florist can order flowers from all over the world. However, we suggest bright tropical flowers as a fantastic complement to the bright greens and blues of our island. Birds of Paradise, Orchids, Tulips, Ginger, Calle Lilies and Hydrangea are most commonly used. 17) What types of wedding decorations? Most brides chose to decorate with bright tropical flowers that complement our blue water and skies. Should you wish to arrange for special decoration, please contact your wedding planner in advance. If you decide to ship or bring your own decorations, we will be happy to assist you. 18) What kind of music is available? Your wedding planner can arrange live music such as steel pan, harp, guitar or live DJ. However, if you prefer your personal collection from your iPod, we will be happy to set it up for you. 19) What about wedding photography and videography? You are welcome to use your own photographer and/ or videographer. However, your wedding planner can always assist you in hiring one if you desire. 20) What types of wedding ceremonies are available? Your wedding planner can arrange for a wedding official and witnesses. The available ceremonies are Civil, Contemporary Christian, Religious Christian, and Jewish. Should you desire a local Rabbi, Priest or Minister, you are allowed to do so. 21) Can I have a Catholic ceremony on the beach? Catholic ceremonies must take place in the Catholic Church, so you will need to contact the church directly to make these arrangements. Many of our bridal couples enjoy a religious ceremony at the local church, followed by a joyful celebration at Sand Dollar. 22) Can I have a Jewish ceremony on the beach? Yes. Please contact the Hebrew Congregation in St. Thomas to request their services and schedule the date. 23) Can I meet with the officiant before the ceremony? The officiant generally meets the bridal couple a few minutes before the ceremony. If, however, you would like to meet with the officiant prior to the event, please contact your wedding planner. 24) What happens if it rains? Generally, rain showers are brief in St. Thomas. You can wait a few minutes, and continue the ceremony. In the event that you need to relocate the ceremony and reception, the picturesque covered deck outside the main level is the best alternative. In our experience, this has never happened! 25) Can I get married on the private beach? Yes, please consult your wedding planner when is the best time of the day to marry on the beach. 26) How many guests can attend the wedding ceremony at Sand Dollar? 27) Can I have a Sunday or Holiday wedding? 28) What kinds of receptions are available? Your caterer can plan any type of reception you choose. This includes, but is not limited to, cocktail hours, buffets or sit-down dinners. 29) What wedding venues are available for the ceremony, reception or banquet? This depends on your preference. You can have an informal dinner or a barbeque on the beach; a formal dinner or a buffet on the pool deck or covered deck. 30) What is the drinking age in the U.S. Virgin Islands?